Tactical Solutions� TSG-22 is a .22LR conversion kit is Tactical Solutions latest conversion for Glock� Pistols. 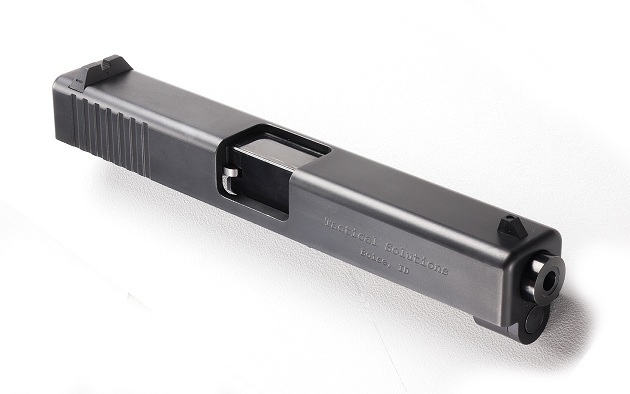 Each model of the conversion kit is precision manufactured to easily install on all generations of the Glock pistol. The 17/22 model is for Glock models: 17, 22, 34, 35, & 37. The 19/23 model is for Glock models: 19, 23, 32, 38. The TSG-22 is designed as an affordable .22LR alternative to complement your Glock� pistol. It is CNC machined from 4140 steel with the highest level of precision. Each conversion undergoes a Nitride surface treatment to increase wear resistance, corrosion resistance, and also reduce friction. It also features factory Glock� sights and ships with one durable reinforced polymer magazine with a 10 round capacity. This TSG-22 conversion comes with a standard, unthreaded, barrel. Heat treated 4140 steel slide with Nitride surface treatment for optimum strength, increased corrosion resistance and increased wear resistance. Easily its all generations of the following Glock� models: 17, 19, 22, 23, 32, 34, 35, 37, & 38 with no gunsmithing required. Comes with one durable polymer 10 Round Magazine featuring a last round hold open. Comes in polymer storage case.